Hundreds of people have queued for hours to register at a dental practice in Llangollen. The BDA has called on the Welsh Government and Local Health Boards in Wales to ensure this situation does not become the ‘new normal’- pressing for real reform of the failed NHS dental system. 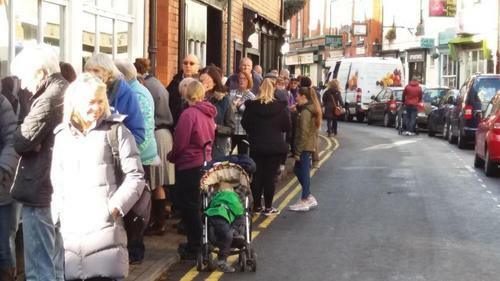 Some of those who queued from 7am told local press they had been forced to abandon dental treatment altogether after the former practice based at the same premises in shut around 18 months ago. Others say they travelled as far as Barmouth as they were unable to find NHS dental services at more local surgeries. Health watchdog officials say the lack of NHS dentistry in many areas of North Wales often triggers a surge in demand when a new practice opens. The BDA recently revealed people across Wales are facing huge journeys to see an NHS dentist. Residents in Aberystwyth now face a 90-mile round trip, while those in Newtown face 80-mile journeys, and even those in the Welsh capital Cardiff face a nearly 30 miles trek. Tom Bysouth, Chair of the BDA’s Welsh General Dental Practice Committee, said: “It’s the 21st Century, and a developed nation with universal healthcare shouldn’t see residents queuing round the block to access basic services. The Welsh Government and Local Health Boards have a responsibility to ensure the scenes in Llangollen do not become the new normal.